CAFÉ DRECHSLER, one of the most unique and irresistible Austrian live acts are back!! Inspired by the influence of electronic club music, drummer Alex Deutsch, bassist Oliver Steger and saxophonist Ulrich Drechsler developed their highly distinct musical style at the beginning of this millennium. What people had only known till then in electronic form from the turntables of club DJs, CAFÉ DRECHSLER presented in a completely acoustic context, an approach which earned them resounding success both nationally and internationally as they pursued a single goal – to get their audiences up and dancing! Now CAFÉ DRECHSLER is back again. AND THAT’S NO EXAGGERATION!!! Based on the best that current acoustic and electronic club music has to offer, they once again create an incomparable mixture of jazz, funk, soul, trip-hop, breakbeat, drum ’n’ bass, minimal and Detroit techno and, and, and!!! Part of this is their new album “And NOW….Boogie!” (Universal Music). This latest release presents the quintessence of the CAFÉ DRECHSLER style: even clearer, even grittier and completely in touch with the here and now! In 14 tracks on drums, Alex Deutsch produces a merciless beat, pulsating grooves and rhythms played live without the safety net of retakes. Oliver Steger’s double bass delivers powerful sounds and booming sub-basses that reverberate deep within your body. Together they provide the highly energetic, seething foundation for their new work “And NOW….Boogie!” Pure energy! Ulrich Drechsler does not play the tenor saxophone simply like a melody instrument. He embeds it entirely into the total experience, and uses it as a source for rhythm and sound and creates fabulous soundscapes. No more is needed! A saxophone, a double bass and drums: the three combine almost somnambulistic style elements in vastly different genres to create the famous CAFÉ DRECHSLER mélange no-one can escape from. The crowning touch is that CAFÉ DRECHSLER invited a number of illustrious guests to join in the production of “And NOW….Boogie!” The Bremen rapper FlowinImmO, a veteran of the German hip-hop music, makes an appearance on “Fake News”. The hot Austrian slam poet and writer Yasmo (Spoken Word) contributes to “Velvet Paws”, while on “Hey Girl” the young and talented musician Aljosha Pfeifer (Beat Programming) contributes to the new CAFÉ DRECHSLER album. “And NOW….Boogie!” is the result of it all. An album reduced to the most essential: honest, intense and simply pure CAFÉ DRECHSLER! Founded in 2000 by Oliver Steger, Alex Deutsch and Ulrich Drechsler, within a very short period the band developed from an insider tip to become an absolute guarantee for the very best in acoustic club music in the Vienna scene. CAFÉ DRECHSLER soon attracted international attention with their albums “Café Drechsler” (Universal Music/2002) and “Radio Snacks” (MouthToMouth/2004). The albums were released in over twenty countries and made it into the top 10 on radio and club charts in, among others, Germany, Greece, Australia and Indonesia. At the same time, the band gave hundreds of live performances in Europe and throughout the world. In 2004 they were nominated for the first time for Austria’s foremost music award, the Amadeus Austrian Music Award. In the following year the band won the Amadeus Award for the best album in the Jazz/Blues/World Music category. In 2006 the band members jointly decided to devote themselves to their own projects. The band members are just as unique in their individual approach as the band! Alex Deutsch is not only one of Austria’s most successful drummers internationally with an impressive discography and biography. He is also a teacher, a role model and a mentor for, by now, a whole generation of young drummers. He is a producer, a music manager (Anna F., Thomas David and many more) and works with a large number of international musicians and artists who are in high demand. Oliver Steger already began focusing on new forms of expression and performance techniques on the double bass in the club music scene in the 1990s. This laid the groundwork for his outstanding abilities and completely personal style and unmistakable sound, all of which have made him one of the truly great bassists. In addition, Oliver Steger is a successful author of children’s books, for which he composes and arranges music performed by his own bands and as part of staged productions. They are complemented by clarinetist and saxophonist Ulrich Drechsler, for whom music involves only sound and emotion. He also does his own projects with important contemporary jazz musicians (among them, Tord Gustavsen and Stefano Battaglia), composes film scores and is considered one of the world’s leading jazz bass clarinetists. After more than ten years, CAFÉ DRECHSLER is now stepping back into the ring and requesting one more dance: with even more irresistible immediacy. Highly emotional music for all the ups and downs of life. Wir verlosen für CAFÉ DRECHSLER LIVE am 27.09.2018 im Porgy & Bess Tickets. Hier am Gewinnspiel teilnehmen. Café Drechsler präsentieren am 22.09. um 17h im Saturn/Gerngross (Mariahilferstraße 42-48, 1070) in Wien im Zuge eines kleinen Konzerts und einer anschliessenden Signierstunde ihr neues Album “And NOW…Boogie”! 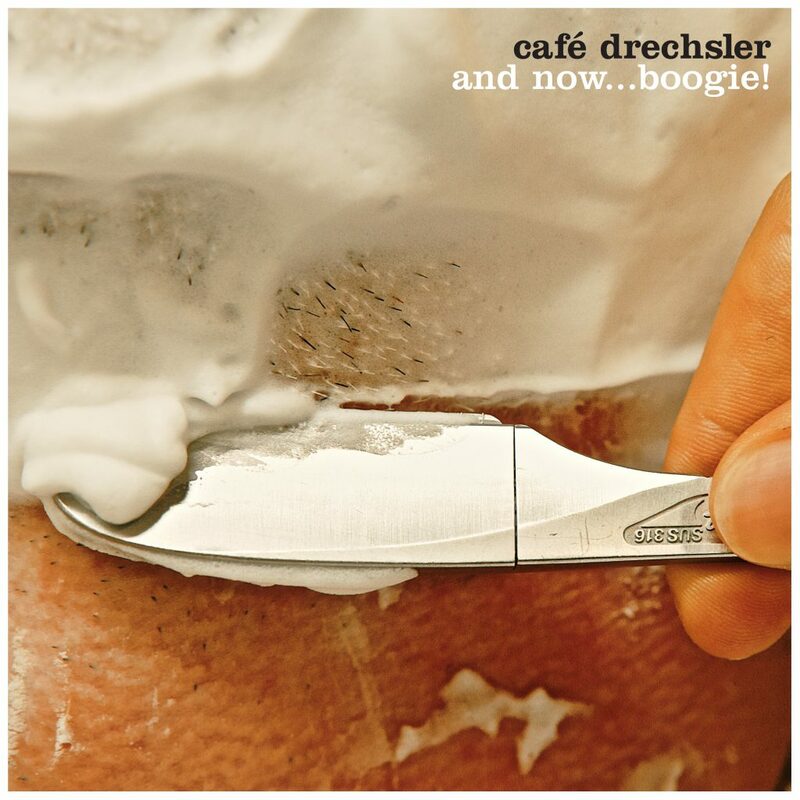 Café Drechsler – And Now…Boogie! Freunde der akustischen Club Music aufgepasst! Eine der legendärsten Live Bands Österreichs ist wieder zurück! Nach über 10 Jahren bitten Alex Deutsch, Oliver Steger und Ulrich Drechsler erneut zum Tanz: Ein Album, ganz auf das Wesentliche reduziert, ehrlich, intensiv und einfach nur CAFÉ DRECHSLER pur! Das Album erscheint am 23. Juni 2017!